At Polio's Epicenter, Vaccinators Battle Chaos And Indifference : Shots - Health News Northern Nigeria is the only region in the world where the number of polio cases is on the rise. International groups have poured money and volunteers into the area to combat the disease. But vaccinators face daunting challenges — from security threats like terrorist bombings to a lack of basic resources like electricity. 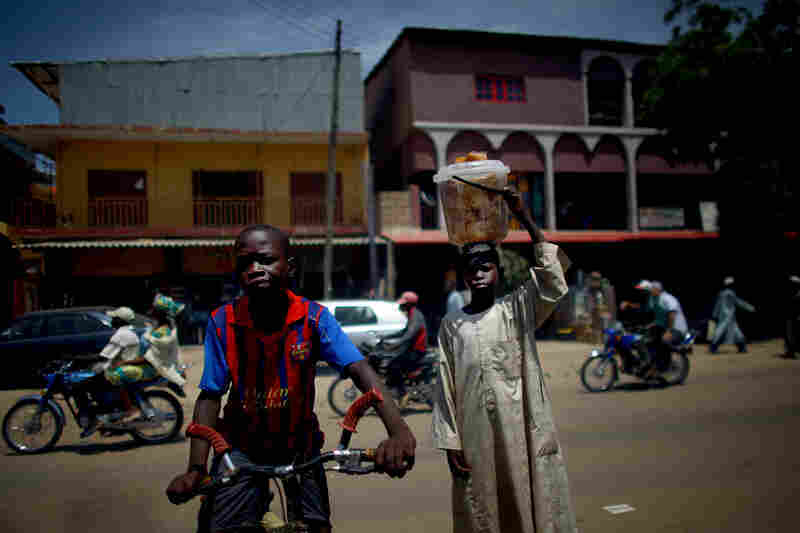 Kano, in northern Nigeria, has been called the "epicenter" of the current polio outbreak. This part of Nigeria is the only place in the world where polio cases are increasing. 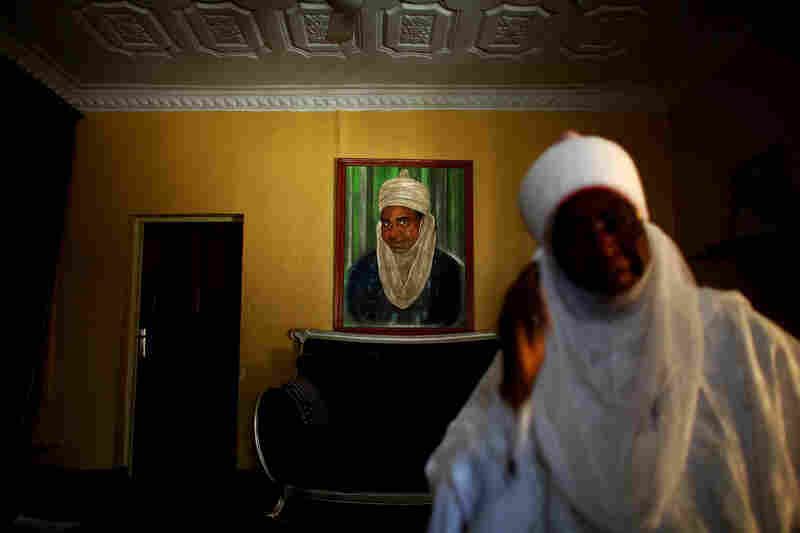 The emir of Kano state is the highest-ranking Muslim leader in northern Nigeria. 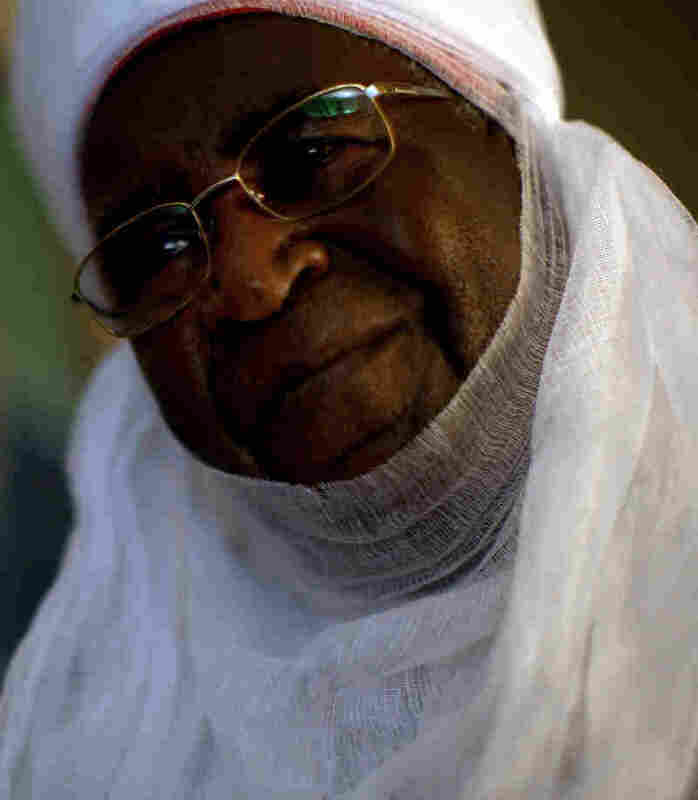 Wada Mohamed Aliyu, seen here, is the emir's point man on polio. Local imams boycotted polio vaccination in 2003 and 2004, but now solidly support immunization. The small farming village of Minjibir, in northern Nigeria, has seen six cases of polio this year. Polio was eliminated from the Western Hemisphere in the early 1990s. It was stamped out in Europe a few years later. Ado Ibrahim carries his son Aminu through the village of Minjibir in northern Nigeria. Aminu, 4, was paralyzed by polio in August. 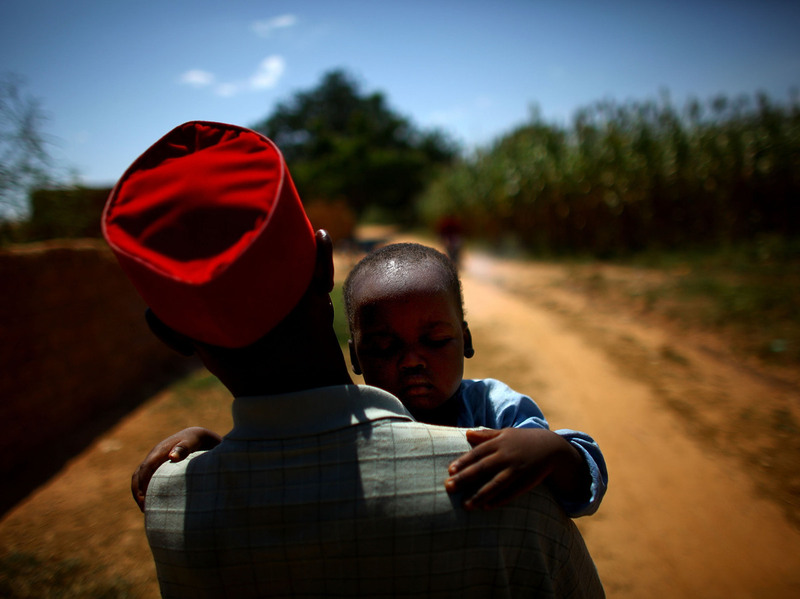 Adamu Ali carries his 4-year-old son, Omar, who was stricken with polio earlier this year. They live in the village of Minjibir. 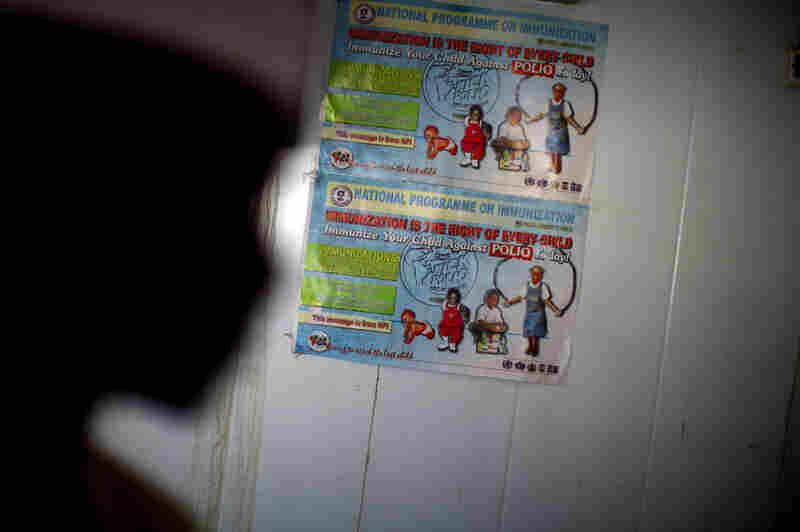 A polio immunization poster is taped on a walk-in refrigerator at a new cold storage facility at a hospital in Kano. The oral polio vaccine must be kept refrigerated; that's been a challenge in a place with only intermittent access to electricity. A nurse at the health clinic in Minjibir prepares to distribute free bed nets to combat malaria. Campaigns like this one, which offers services for malaria, attract local residents to the clinic. While they're there, residents are encouraged to get their children vaccinated against polio. 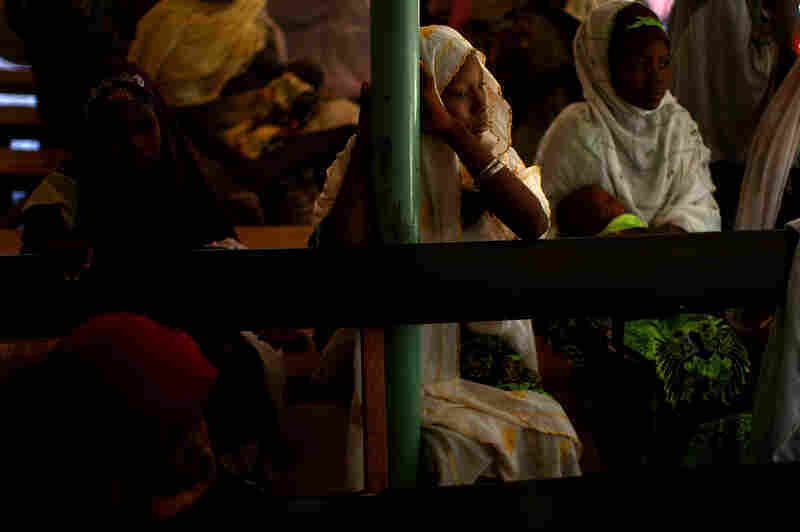 At the health clinic in Minjibir, women wait for their children to receive the polio vaccine. 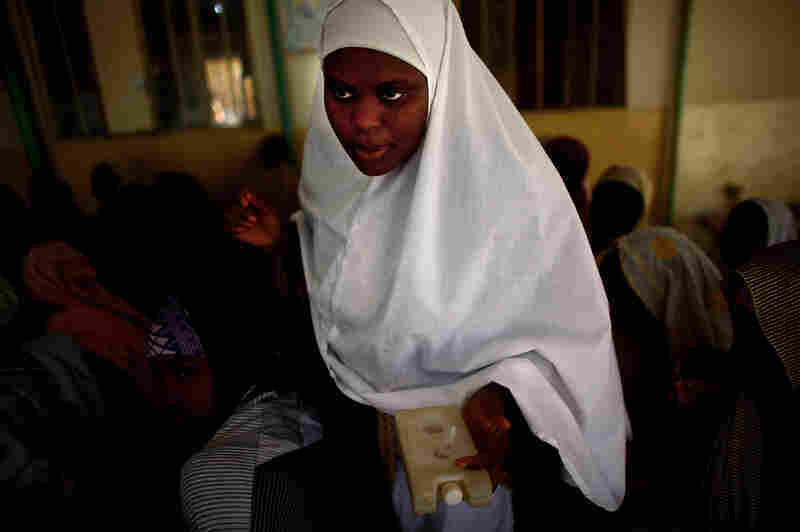 Sahya Idriss, a service provider at the health clinic in Minjibir, carries a vial of the polio vaccine. A child is vaccinated against polio at the Minjibir health clinic. The procedure, in which two drops of vaccine are pinched into a child's mouth, only takes a few seconds. Children should get at least three doses of the vaccine, spread out over time. Hawa Bello, a social mobilization consultant with UNICEF in Kano, meets with community volunteers. The volunteers are given a small stipend to guide polio immunization teams through their individual neighborhoods. It's the volunteer's job to make sure every child under 5 in a given neighborhood gets vaccinated. Men of all ages gather at a welding shop run by polio victims. The men make hand-cranked tricycles and customized motor scooters for people paralyzed by polio. 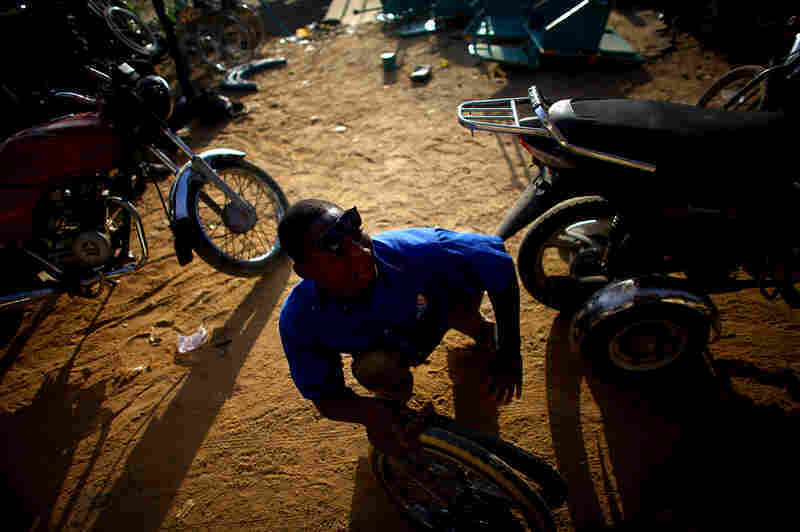 Sani Mohamed is a welder and mechanic at a shop run by polio victims in Kano. 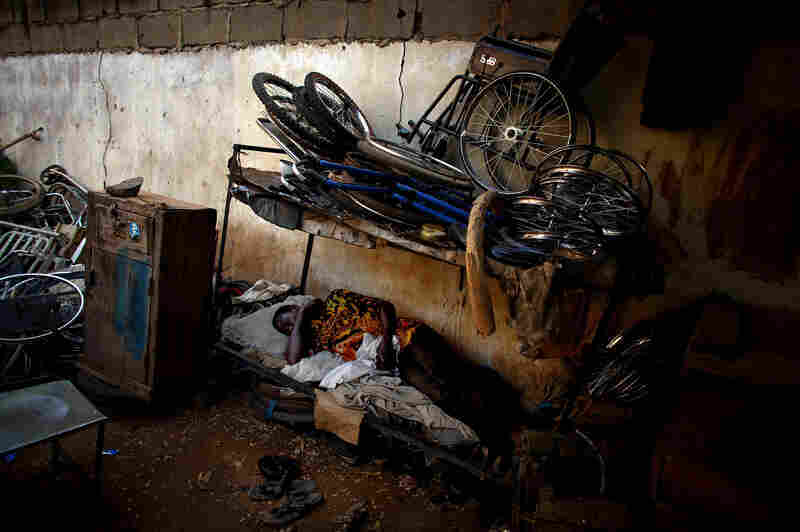 A man naps at a scooter and tricycle shop run by polio victims in Kano. A child crosses a bridge over the cement-lined Gogo stream, which flows behind the main market in Kano. Sanitation workers regularly test the sewage here for the presence of the polio virus. Polio was eliminated from the Western Hemisphere in the early 1990s. It was stamped out in Europe a few years later. And now, even the Congo and Somalia are polio free. 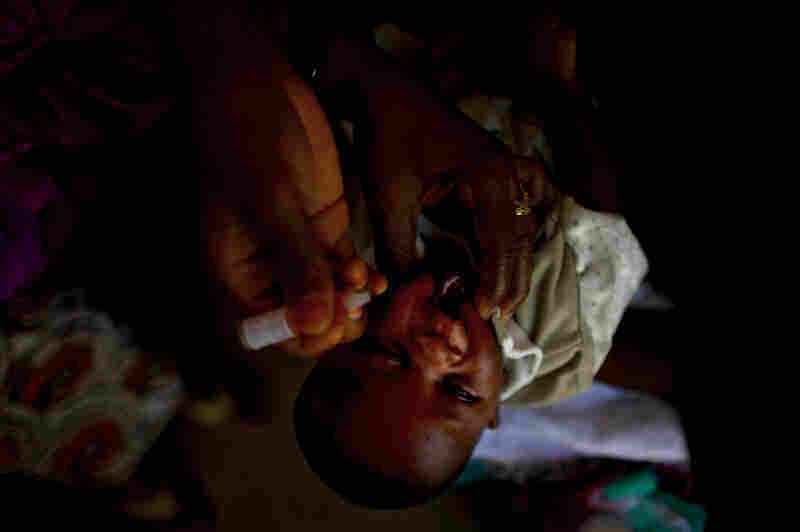 But in Africa's largest oil-producing nation, Nigeria, polio has been a difficult, contentious foe. A decade ago, Muslim clerics in northern Nigeria dealt a major setback to global polio eradication efforts when they denounced the vaccine as a Western plot to sterilize Muslim children. The result was an explosion of polio, not just in northern Nigeria, but in 20 other countries that previously had been declared polio free. Since then, international organizations have poured extra resources and hundreds of additional staff into Nigeria to combat the disease. But still, northern Nigeria is the only place in the world where polio cases are increasing: As of Sept. 1, it had recorded 90 polio cases in 2012 — or nearly three times as many as in the same period last year. The city of Kano in northern Nigeria has been called the "epicenter" of the current polio outbreak. And remnants of the paralyzing disease are visible even on its streets. Polio victims drag their shriveled legs through traffic at intersections, begging for crumpled bank notes. Signs declare "End Polio Now." Vaccination campaigns are regular fixtures here. 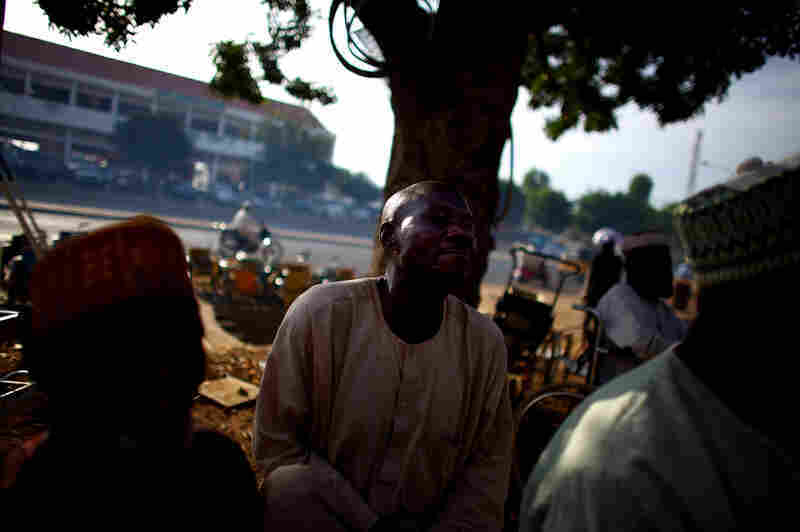 Just outside Kano, in the small farming village of Minjibir, six kids have been paralyzed by polio this year alone. Four-year-old Aminu Ibrahim is one of them. His father, Ado, says the boy got severely sick in August. "It all started with fever, initially," he says. Then after the fever subsided, Aminu could no longer walk. 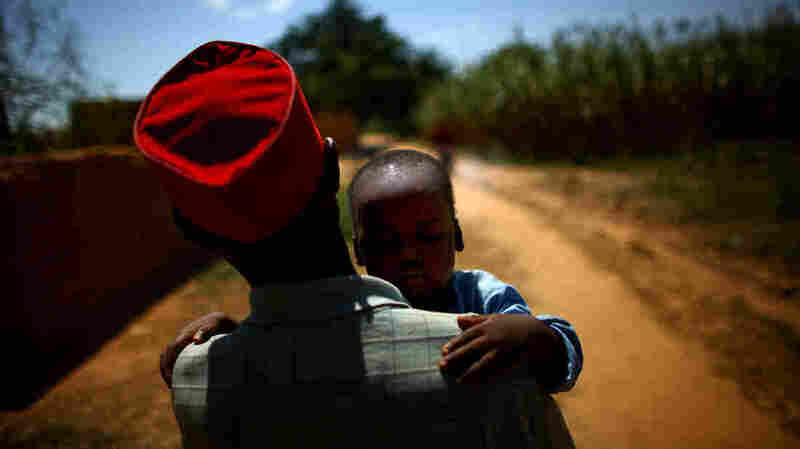 Ibrahim holds his son on his hip outside the family's simple, mud-walled house. Aminu's paralysis is so recent that his right leg hasn't yet atrophied. It still appears plump and calloused at the heel, just like his good leg. Ado Ibrahim carries his son Aminu through a village in northern Nigeria. 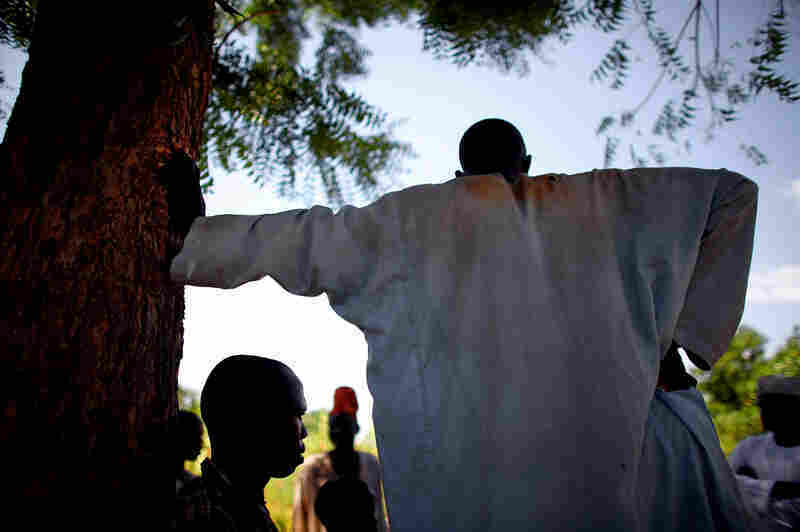 Aminu was paralyzed by polio in August. Ibrahim insists that his son was immunized for polio at least once, but the child should have received multiple vaccinations for full protection. In the past few years, religious leaders in this region have gone from opposing vaccination to requiring it. 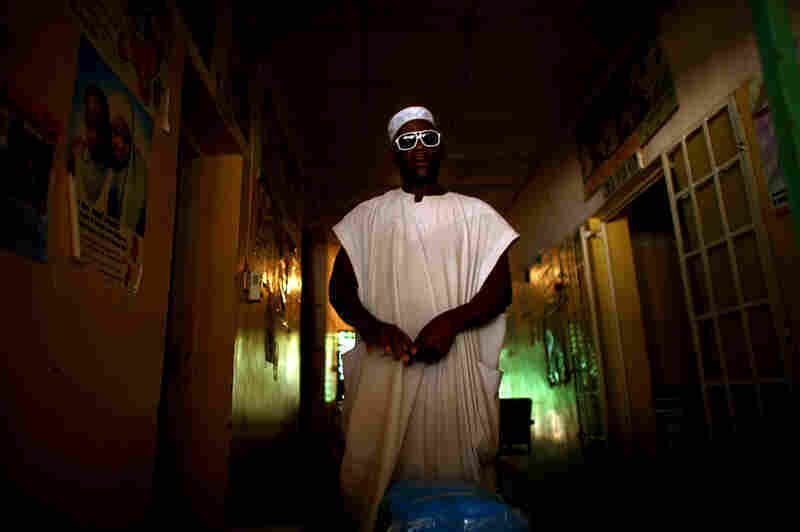 "We have to force you to do it, whether you like it or you don't like it," says Wada Mohamed Aliyu, the polio point man for the emir of Kano state, the region's top-ranking Muslim. Aliyu says parents who refuse to vaccinate their children will not be tolerated: "Why? Who are? We don't care if it's something that will affect you and your family alone. But [if] you don't comply with us, you allow your child to go — he's going to spread it to 200 other innocent children around the vicinity." This newfound zeal from Muslim leaders has helped overcome resistance to the vaccine, but there's still a major problem of kids falling through the cracks during immunization drives. The local ministry of health is attempting to address this by restructuring the campaigns. Instead of having outside vaccination teams that travel from place to place, so-called volunteers are responsible for making sure every child under the age of 5 in their particular neighborhood, village or slum gets the vaccine. The volunteers receive a small stipend each month. Aliyu says this is a brilliant way to make sure no child is missed. "These people are the backbone of the work," he says. "They are the ones that stay in the bush. And they know their people, and they know the area very well — like a beggar knows his dish!" But this involves setting up vast networks of volunteers to blanket the entire state. 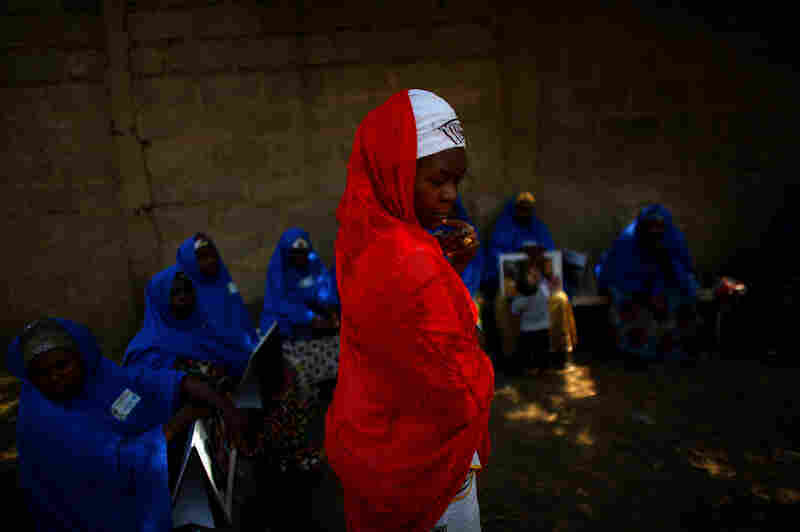 Outside a dilapidated rural health clinic near Kano, mothers sit on long wooden benches holding their babies. The women's colorful headscarves glow against the drab, mildewed walls of the clinic. A nurse pinches two drops of polio vaccine in each child's mouth. The oral vaccine is relatively simple to administer, but vaccinators still need some basic training. The vaccine, for instance, must be kept refrigerated, and children should get at least three doses spread out over time. The health commissioner for Kano state, Dr. Abubakar Labaran Yusuf, says in the past, some people who were trained and paid to be vaccinators would send an untrained friend or relative as a replacement. "He will end up, instead of dropping in the mouth, he will drop it in the nose, which will not help. Instead of two drops, not even drop — or spray the whole thing," Yusuf says. 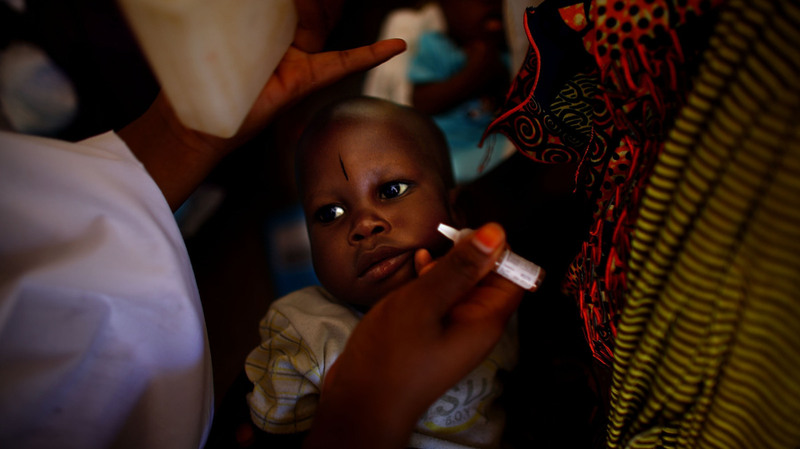 A child is immunized against polio at the health clinic in a farming village in northern Nigeria. The procedure involves pinching two drops of the vaccine into the child's mouth. For full protection, the child needs three doses, spaced out over time. Organization is one of the big challenges facing the polio eradication effort in northern Nigeria. Polio immunization campaigns are frequently postponed, understaffed or under-resourced. The local health ministry is heavy on bureaucratic procedures and light on resources. Most health clinics, for instance, don't have electricity. And while eradicating polio was declared an emergency by the World Health Assembly this year, there is little or no sense of that urgency among ordinary Nigerians. In fact, as polio becomes almost extinct, some people are suspicious when a large polio vaccination campaign rolls into their village, says Suleiman Abdullahi from the World Health Organization. Some villagers argue that malaria is a far bigger problem than polio and question why aid groups aren't doing something about that. "Some felt that there are no drugs in the hospital, and then why are you coming to my house and giving me free things?" Abdullahi says. The city of Kano has been called the epicenter of the current polio outbreak. 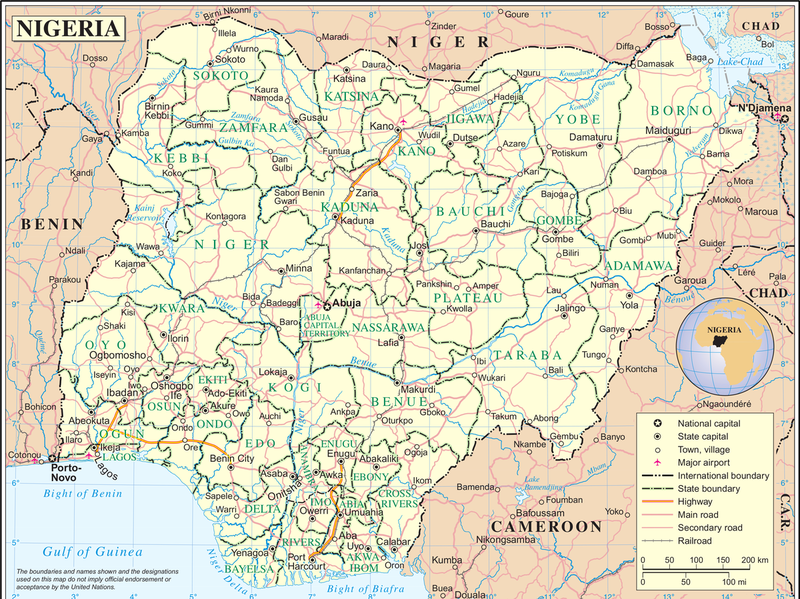 It's located in the central part of northern Nigeria. Another major problem in the area is security. Bombings and shootings by Boko Haram, an Islamic extremist group, have killed hundreds of people this year across northern Nigeria. Those attacks have led to unpredictable curfews, street closures around police stations and military checkpoints on major roads. Poor sanitation is also an issue. In Kano's sprawling slums, ditches filled with trash and fetid water line the dirt streets. Behind the city's main market, raw sewage flows into a concrete canal. To keep tabs on where the polio virus is popping up, city health officials have started monitoring this effluent. 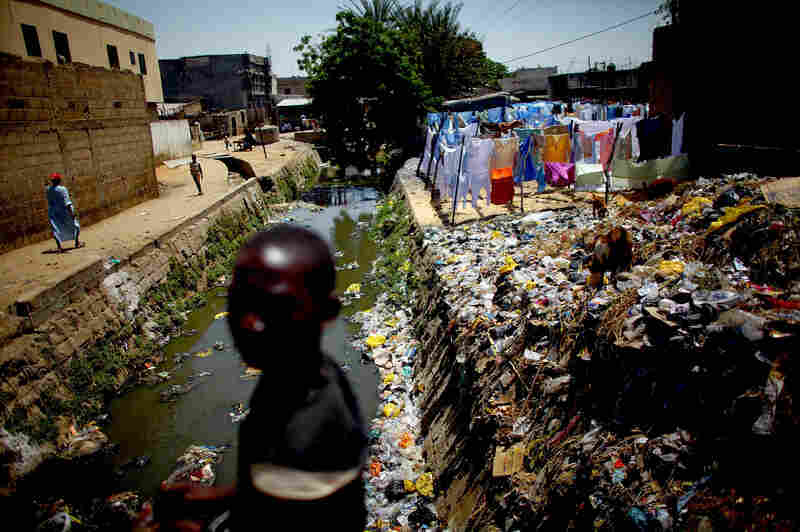 Abdul Magaji, a sanitation worker in Kano, has been taking samples at the sewage stream for more than a year. So far, officials have only detected live polio virus once in the sewage, but Magaji's supervisor says the plan is for more sampling sites across the city in order to detect polio in an area before it strikes. That seems to be the main strategy for fighting polio in northern Nigeria — do more of everything: more surveillance, more staff and more vaccinations; and launch an all-out offensive until the virus has nowhere left to hide. But the big question remains: Is Nigeria capable of fully mounting that offensive and sustaining it until the job is done?